Many of the best films of the New York Film Festival can be found in the excellent sidebars to the main program, allowing viewers to explore little-seen corners of film history. 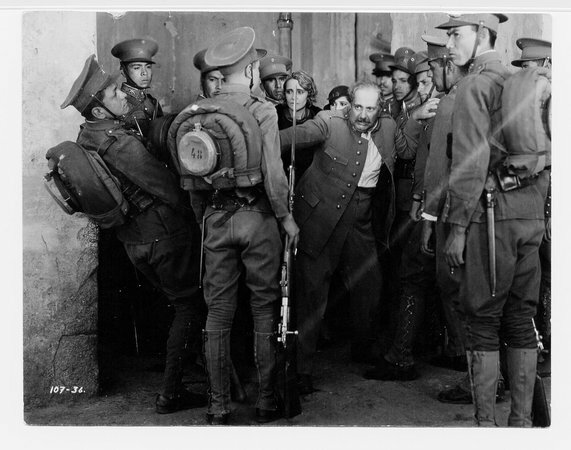 One great opportunity for (re)discovery is Fernando de Fuentes’ “Mexican Revolution Trilogy,” three 1930s films that dramatize Mexico’s early 20th-century revolution, during which revolutionary hero Pancho Villa waged bloody battles with government forces, with his band of loyal Zapatistas. These three films have often been compared to those of John Ford, and indeed de Fuentes shares many of the same gifts of landscape composition, narrative economy and vivid characterizations that epitomized Ford’s style of filmmaking. Most surprisingly, these films are far from the uncomplicated celebrations of revolution that one might expect; rather, they depict often very un-heroic behavior (there are many scenes of soldiers and revolutionary guerillas drinking and carousing), and deal with very thorny moral conflicts. These films also show that freedom fighting does not always lead to victorious glory, but rather, in many cases, to betrayal and ignominy. The elegantly concise style de Fuentes brings to this material is exhilarating and visually inventive, and these films are quite accessible even if you know little of the history they depict. In “El Compadre Mendoza”(1934), the best film of the trilogy and an admired classic of Mexican cinema, hacienda owner Rosalio Mendoza (Alfredo del Diestro) precariously navigates between the interests of both Victoriano Huerta’s government and Emiliano Zapata’s rebels. He feeds, wheedles, and wines and dines soldiers from both sides, changing the portraits on his wall of Zapata and Huerta, depending on his visitor. “I don’t like romanticism and sighs,” Mendoza is fond of saying, priding himself on always being pragmatic and making quick decisions. One of these decisions is marrying Dolores (Carmen Guerrero), as well as adding a son to his family in short order. However, juggling all his interests become more difficult as the battles continue, and he is forced to choose a side once and for all, one that involves betraying a close friend of the family. “El Compadre Mendoza”shifts imperceptibly from light comedy to a much more somber and complex moral tale. Del Diestro gives a terrific performance, creating a multilayered portrait of a man who has long ago lost his moral compass and in the conclusion becomes a shell-shocked shadow of his former self. “Let’s Go with Pancho Villa” (1936) belies the rousing fervor suggested by its title and instead offers a rather pessimistic view of passionate idealism that clashes violently with the brutal realities of life on the battlefield. 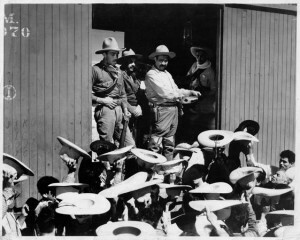 The film follows five friends who decide to join Pancho Villa’s army, and are continually tested by the great leader to prove their mettle and their worthiness as revolutionary soldiers. These self-described “lions of San Pedro” remain true believers in Villa’s cause, even as they die one by one, and are eventually discarded by their hero. Pancho Villa (del Diestro again), is initially shown as a benevolent man feeding his men corn and inspiring his followers, but he doesn’t always come across as virtuous. A drunken challenge at a cantina involving a gun thrown in the air, a sort of inverted Russian roulette, hints at how callously Villa regards the men who risk their lives to support him. “Let’s Go with Pancho Villa” is the film of the trilogy that most evokes John Ford, with its massive battle scenes with scores of extras, mountain-filled landscapes, and characters framed against the sky above like human monuments. The crowds of men fighting valiantly give way in the conclusion to a lone figure walking down train tracks, robbed of his friends and the cause that he sacrificed everything for. Fernando de Fuentes’ “Mexican Revolution Trilogy” screens at the Walter Reade Theater on September 29 and 30. To purchase tickets, visit the New York Film Festival website [http://www.filmlinc.com/nyff/2010/trilogy].